Many people I meet think they are spending too much on groceries every month. Years ago I was in the same position, spending over $800 dollars a month to feed a family of six. My biggest problem, lack of planning. I would go to the store each week with a small list of essentials- milk, diapers, bread and come home with hundreds of dollars worth of food we didn’t need. This food would then sit in my fridge and pantry for weeks because I didn’t have a plan to use it. Then one day, when we decided to get serious about our finances, I realized that even though I didn’t have an income, I could help reduce our spending. The first area I examined (after cutting cable) was the grocery budget. I didn’t have any idea how much I was spending each month, but I was sure I could spend less if I just had a plan. It was then that I learned about menu planning. I started creating weekly meal plans for my family and shopping lists based on the meal plan. I am sure it is no surprise that my monthly grocery budget was drastically reduced, immediately. Menu planning had another unintended consequence to our family’s budget. We ate out significantly less, thereby saving our family more money and improving our nutrition. Having a meal plan meant less “oh no, it’s 5 o’clock and I don’t know what to make for dinner” moments that resulted in take-out pizza or the drive-thru. Those who fail to plan, plan to fail. If you are struggling in this area, here are 5 Simple Ways to Menu Plan. If you want to have a successful plan, ask your family what they like to eat. If no one is eats what you prepare your menu planning will be in vain. Every few months I poll my family and ask them to list their favorite meals. I try to incorporate their favorites into my weekly plan. While I can’t accommodate every person every week, if they know I am considering their preferences in my planning they are better eaters throughout the week. I have about forty meals on my list. One afternoon last year I sat down and made a list based on preferences, nutrition, cost, and convenience. Whenever I am having trouble thinking of a meals I go back to my list. Depending on the budget, or other meals I’ve planned, I choose a few off the list. On weeks that I’m really not motivated, I pick all the meals off the list. This list takes the thinking out of planning. I create a weekly meal outline instead of assigning meals to specific days of the week. This works well for our family due to my husband’s work schedule and the fact that with eight people in a house things are always changing. If a doctor’s appointment comes up, that might be a good night for the crock pot meal or if we are going to be home all day I might make the more involved meal on that evening. Being flexible with my meal planning has allowed me to be successful with the implementation of these meals. This works well for families that have a set schedule as well as for families who need a strict routine. I have child who asks what we are having for dinner before he puts the first bite of breakfast in his mouth. Some children do better when they know what to expect and themed nights can really help with mealtime struggles. The hardest part of menu planning…. getting started. Then make a plan. 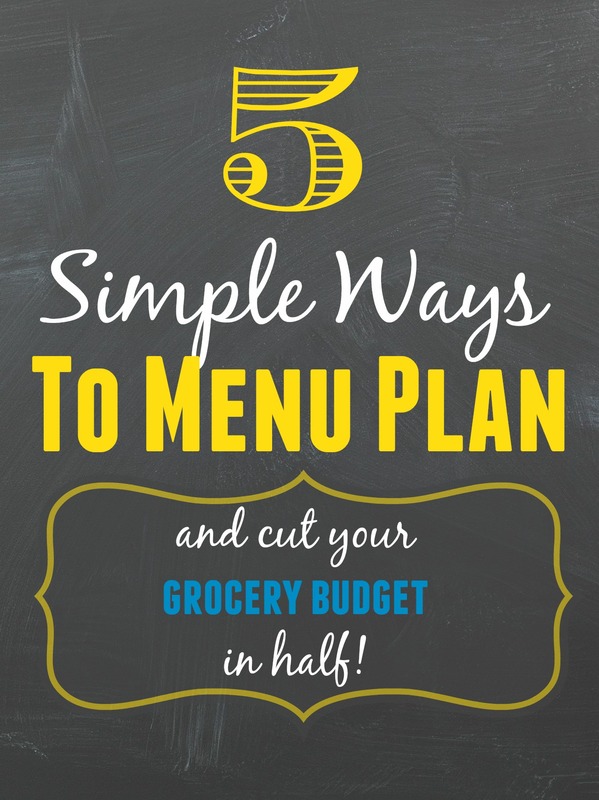 Here is a basic printable menu plan that you can use to get started. Set aside 30 minutes a week (maybe 45 minutes if this is your first time) to create a menu plan and a shopping list. Sometimes you can create a menu plan just by shopping your freezer and pantry, other times you can create a plan based on your weekly sales flyers. Menu planning is really quite simple and once you start you’ll wonder why you waited so long to begin. Okay, I realized I said five simple ways, but after years of teaching menu planning classes and talking to hundreds of home managers I realized that sometimes it is cheaper to pay for a low cost menu planning service than to not do it at all. 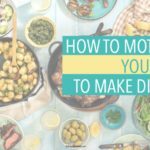 Here are a few meal planning services and resources I would recommend if you need help getting started. I like eMeals because they allow to pick your plan based on family size, grocery store, or dietary needs. The recipes are easy to make and the ingredients are easy to find in the store. They offer a variety of plans including paleo, clean eating, low calorie, kid friendly, budget friendly, gluten free, vegetarian and more. Every week you receive your meal plan in your inbox as well as a shopping list. It makes menu planning extremely easy. They offer a 14 day free trial and monthly fees range from $5-$10 a month. Sign up for a free 14 day trial here. Plan to Eat is an online menu planner that uses your recipes, scheduled for the days you want them. It automatically makes your grocery list, organized the way you like to shop, using the recipes you’ve selected. Plan to Eat makes it easier to eat real food, prepared at home, with your family gathered around your own table. This is a great program if you are on a very specific diet or have picky eaters because you are pulling from your own favorite recipes. They have a 30 day free trial and the monthly fee is $4.95 a month of $39 for the entire year. Sign up for your free trial here. The $5 Meal Plan is a meal planning service from $5 Dinners. Meal plans include five dinner entrees with sides. Each week they include one freezer friendly, one slow cooker, and one 20-minute meal. Also included is one lunch and one breakfast, plus a random goodie each week – sometimes it’ll be a dessert, sometimes a beverage, and sometimes it’ll be a snack (sometimes more than one!) – Treat yourself to something fun! Meals in this meal plan cost less than $2 a person, so this is definitely a budget friendly option. The $5 meal plan is (you guessed it) $5 a month. They offer a free four week trial, sign up for your trial here. The Scramble is a weekly meal planning subscription service that provides meals, side dishes, and a shopping list. You can customize your weekly meal plan by swapping out recipes with their recipes or your own. Your shopping list is automatically updated when you swap out recipes. The price ranges from $4-$10 a month depending on the length of your subscription. The offer a 14 day free trial, you can sign up here. If you need a little help in the morning check out this breakfast station idea. The basic idea is that your breakfasts are set up and ready to go so the kids can help themselves to a healthy breakfast. There is a free version, and a paid version that is $3.99. Save Money. Better Nutrition. Less stress. What’s holding you back from menu planning? See all of our Meal Planning Resources here! I just started menu planning a few months ago. It has saved us so much money. And my husband likes that we don’t have the daily struggle over deciding what to have for dinner. I don’t know why we weren’t doing this all along! Also, I love that so many bloggers are posting their own menus. It gives us so many new ideas and recipes to try! I would love to see your list of 40 meals just to get some ideas! Great post! Meal planning has been a God-send for me. Instead of buying ‘I think this might sound good this week’, I buy specific things for meals. I use theme-nights, because I LOVE cookbooks but was having a hard time getting the recipe from the book onto the table! The themes helped me catagorize my recipes and then I can pick one out for each day. The thing I struggle with (because I’m still single) is leftovers. I find that one person eating healthfully doesn’t really eat much, and even when I halve the recipe I have leftovers. I only have 1 leftover night a week, and so I struggle to figure out how to eat leftovers and still have a meal plan with variety in it. I don’t want to cook one night, have the leftovers the next two nights, and only end up making 2 recipes a week! I’d go nuts! I have two thoughts for you to consider. Oops, hi, my name is Lynn. Anyway, one is to maybe invite a friend to share meals with and/or the cooking plans and duties or just take turns. The other is seeing if the meal will freeze well in the seal-a-meal type things and bring it to work/school for a lunch the next week. I kinda do what Lynn suggested, but I make up several different dishes & then freeze them in individual serving sizes – I cook like I am cooking for 6 to 8 people & make at least 6 to 8 different dishes. Then I can just take something out of the freezer for my meals (lunch or dinner). I try to make enough for the whole month. Another thing I do, when I buy veggies (green peppers, broccoli, onions, etc) I cut them up & put them in a single layer on a tray that I put in the freezer until they are frozen (moving them every once in a while, until they are frozen) & then I bag them up – easy to grab just what you need, w/o it all being stuck together. Takes like 20 to 30 minutes to get them frozen enough that they won’t all stick together. Why not eat leftovers for lunch and save money there too? That’s what we do! Just because you made it last night doesn’t mean that you have to eat it again the very next day either. Plan your menu so that you have leftovers from Monday night on Wedesday for lunch and so forth. Leftover food is good for several days in the fridge so you shouldn’t get burned out eating the same thing for several days in a row. Also, look at what you can do to change a leftover into something else. For instance, you can make a small roast or chicken with veggies one night and then cut up the leftovers and make them into soup or a pot pie a couple of days later. The possibilies are limitless! I freeze my leftovers in one serving size containers, and eat them for lunches during the week. I rarely waste any food, and it saves me that much more in the budget when I’m not buying other food for lunches. I personally do not like to menu plan. I buy by the sales and try to always have food on hand. In the back of my head I always know what kind of food a I can make that week. Right now I have pasta, potatoes, french fries, wild rice and white rice on hand. Plus canned and frozen vegetables and at least 2 or 3 types of of meats in the freezer if not more. This is what I do too, shop the sales. Then I plan around what I bought, instead of buying around what I planned. In the long run, I save hundreds of dollars a year on groceries, and we mostly eat pretty good. I plan menus around the basic meats–ground beef, other beef, chicken, sausage, fish / seafood–plus one meatless (or almost). That’s 6 new meals. Eating leftovers 1x a week AND using some leftovers with something makes 7 meals. We also eat leftovers for lunches regularly or freeze them and have them another week. Saves money and TIME! Great tips! I love the idea of asking your family what they want to eat. This takes some of the pressure off. In our home, we started assigning each child a day of the week to pick what we cooked for dinner. My 2 oldest love to flip through my cookbooks and pick something new. I have a dry erase calendar on the fridge for keeping track of appointments/playdates (i only have 2 kids, so 8×11 is fine) etc. I can see at a glance if we are available when something new comes up. I started writing my dinner plans in green at the bottom of each square. We can quickly know what to expect for dinner and I can quickly move things around as events change. What’s really important for me is the meals that require perishables can be moved to the first of next week, so I know I won’t forget to cook something and end up throwing out rotten perishables. I sit down with the weekly flyers and try and include some of the sales items in my menus. I also look at my schedule for the week and plan simpler meals for the days that I work. On days that I am off I can plan more involved/complex meals because I have more time to put into them. It is great to see that interest is sparking for menu planning. I have been planning menus for years . As a working mom , ( my kids are adults now ) it was the only way to reduce stress and to save money . The whole family was involved with the planning , and when the children got older they started preparing many of the meals . As the children went off to sports activities and college and we were down to just the two us , I had gotten away from planning menus. After a month or so my husband started planning the menus, he said he just couldn’t take the the uncertainty anymore . It is much easier now to plan , there are so many websites , magazines that offer such creative ideas. So I encourage everyone to pick up the pen and pad , take the time to plan . You will see that you can feed your family and create wonderful meals , yet save yourself time , stress and money. !@!@! @Hey Webmaster@!@!@! I didn’t know the preferred way to get in contact with so I hope you don’t mind me contacting you via this post. I really like your WordPress blog, but I think there are a few issues with your current theme that are causing you to miss out on some income opportunities. Take a look at the Socrates theme (I provided a link to their website). It is easily the most efficient theme that I’ve come across to maximize earnings from WordPress blogs. Good luck and I hope that you’re able to capitalize on some of that additional income that your current theme is leaving on the table! I planned our families meals for years. Saves money and evening chaos! Lately, I’ve tried an online service called No More To Go. They use fresh ingredients instead of boxed and canned. Have really liked it a lot. Great post! I totally agree with you meal planning has many benefits, I’ve never looked back since I started. Hi Toni, thank you so much for including The Six O’Clock Scramble among your recommendations for meal planning! There’s nothing I love more than helping families enjoy more dinners together by helping them get healthy and delicious meals on the table with a lot less time, money and stress. Your blog is such a wonderful resource for moms, I’m honored to be included on it. I love all the things you post and they are so helpful ! I was just looking at the bottom part of this post “Easy Breakfast Station” and just wanted to share that the Page could not be found and also after subscribing, there is this thank you “Homemade Christmas Gifts” that will not open either. Just thought you may want to know. If you are able to fix those, I would LOVE to know ! Thanks for all you share ! Also, here is the link for the Easy Breakfast Station, and I’ve corrected the links on that page. Thanks for letting us know. Making a meal plan is essential for eating healthy. I have never been very good at eating healthy at every meal, but you have some great tips here to help with that. I have never made a meal list before, but I like that. Having a list to fall back on would be really convenient, thanks! I use the Winn Dixie app to make a list of sale items. I stock up on sale items, and after doing this for a while, I suddenly found I never run out of anything, and I don’t pay full price for much. It means I don’t do a traditional grocery list of what we need, because with stock, what we need is always there. I plan meals around what I have purchased, rather than purchasing around a meal plan.